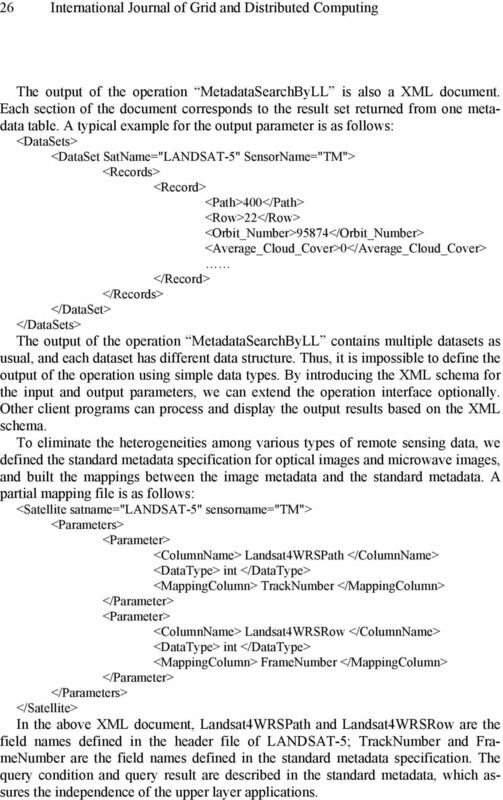 Download "Remote Sensing Images Data Integration Based on the Agent Service"
2 24 International Journal of Grid and Distributed Computing then, the image metadata are exposed using the Metadata Retrieving service. In order to enable researches to access multiple remote sensing images stations simultaneously, we designed an Agent service to take over users queries and invoke the corresponding Grid services. We developed a platform for the integration of remote sensing images. 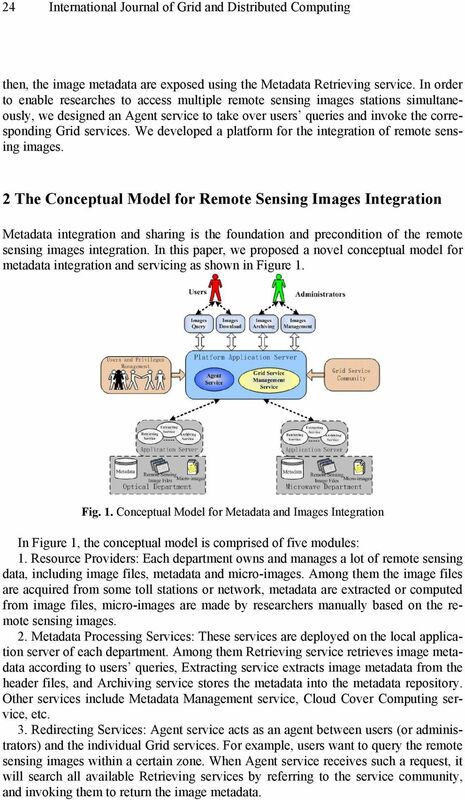 2 The Conceptual Model for Remote Sensing Images Integration Metadata integration and sharing is the foundation and precondition of the remote sensing images integration. In this paper, we proposed a novel conceptual model for metadata integration and servicing as shown in Figure 1. Fig. 1. Conceptual Model for Metadata and Images Integration In Figure 1, the conceptual model is comprised of five modules: 1. Resource Providers: Each department owns and manages a lot of remote sensing data, including image files, metadata and micro-images. Among them the image files are acquired from some toll stations or network, metadata are extracted or computed from image files, micro-images are made by researchers manually based on the remote sensing images. 2. Metadata Processing Services: These services are deployed on the local application server of each department. Among them Retrieving service retrieves image metadata according to users queries, Extracting service extracts image metadata from the header files, and Archiving service stores the metadata into the metadata repository. Other services include Metadata Management service, Cloud Cover Computing service, etc. 3. Redirecting Services: Agent service acts as an agent between users (or administrators) and the individual Grid services. For example, users want to query the remote sensing images within a certain zone. When Agent service receives such a request, it will search all available Retrieving services by referring to the service community, and invoking them to return the image metadata. 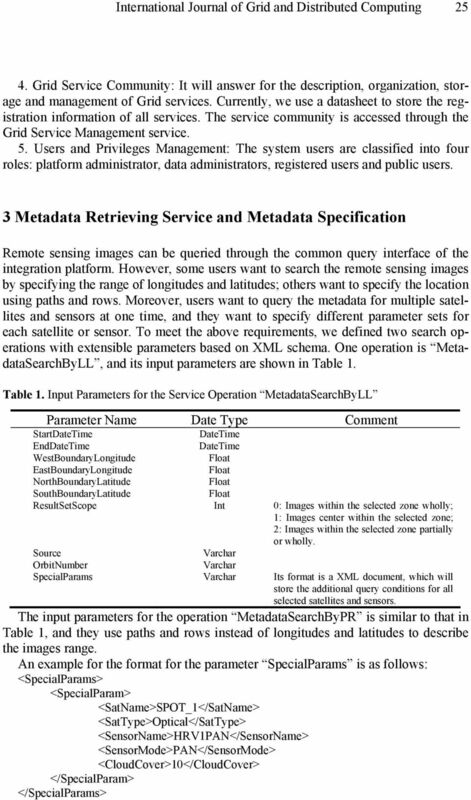 4 26 International Journal of Grid and Distributed Computing The output of the operation MetadataSearchByLL is also a XML document. Each section of the document corresponds to the result set returned from one metadata table. A typical example for the output parameter is as follows: <DataSets> <DataSet SatName="LANDSAT-5" SensorName="TM"> <Records> <Record> <Path>400</Path> <Row>22</Row> <Orbit_Number>95874</Orbit_Number> <Average_Cloud_Cover>0</Average_Cloud_Cover> </Record> </Records> </DataSet> </DataSets> The output of the operation MetadataSearchByLL contains multiple datasets as usual, and each dataset has different data structure. Thus, it is impossible to define the output of the operation using simple data types. By introducing the XML schema for the input and output parameters, we can extend the operation interface optionally. Other client programs can process and display the output results based on the XML schema. To eliminate the heterogeneities among various types of remote sensing data, we defined the standard metadata specification for optical images and microwave images, and built the mappings between the image metadata and the standard metadata. A partial mapping file is as follows: <Satellite satname="landsat-5" sensorname="tm"> <Parameters> <Parameter> <ColumnName> Landsat4WRSPath </ColumnName> <DataType> int </DataType> <MappingColumn> TrackNumber </MappingColumn> </Parameter> <Parameter> <ColumnName> Landsat4WRSRow </ColumnName> <DataType> int </DataType> <MappingColumn> FrameNumber </MappingColumn> </Parameter> </Parameters> </Satellite> In the above XML document, Landsat4WRSPath and Landsat4WRSRow are the field names defined in the header file of LANDSAT-5; TrackNumber and FrameNumber are the field names defined in the standard metadata specification. The query condition and query result are described in the standard metadata, which assures the independence of the upper layer applications. 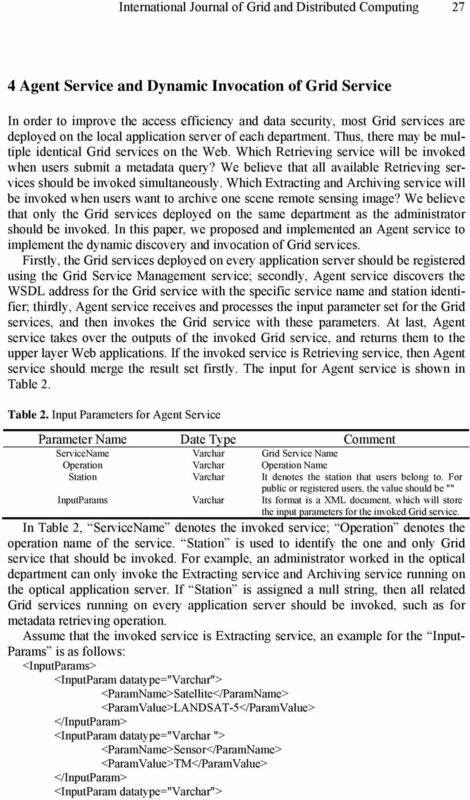 6 28 International Journal of Grid and Distributed Computing <ParamName>Station</ParamName> <ParamValue>OP</ParamValue> </InputParam> <InputParam datatype="varchar "> <ParamName>HeaderFile</ParamName> <Param- Value>ftp:// /p121r34_5t met</ParamValue> </InputParam> </InputParams> In C#, we add a Web reference to the Agent service with the reference name Agent, and invoke the Extracting service based on the Agent service as follows: Agent.AgentService as = new Agent.AgentService(); as.serviceinvoke("extractingservice", "Extract", "OP", "<InputParams>"); The effect of these statements is equivalent to that of the following statements: Extracting.ExtractingService es = new Extracting.ExtractingService(); es.extract("landsat-5", "TM", "OP", "ftp:// /p121r34_5t met"); Based on the above discussion we can see that, by using Agent service, Grid service can be discovered, bound and invoked dynamically. Thus, any remote sensing data can be accessed and processed through the integration platform as long as they are encapsulated using Grid services and registered in the service community. Moreover, Agent service provides parallel queries and faults tolerance to improve the efficiency and reliability of the Web applications. 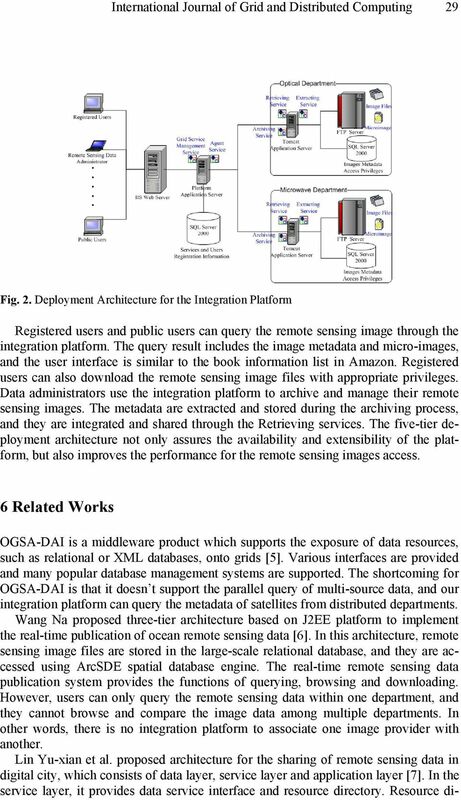 5 Architecture for Remote Sensing Images Integration Platform In order to implement the organization, storage, management and sharing of remote sensing data, we designed a deployment architecture for the integration platform. The guiding idea of the design is to improve the performance and availability of the platform, and to assure the security of the remote sensing data that possessed by different departments. In Fig. 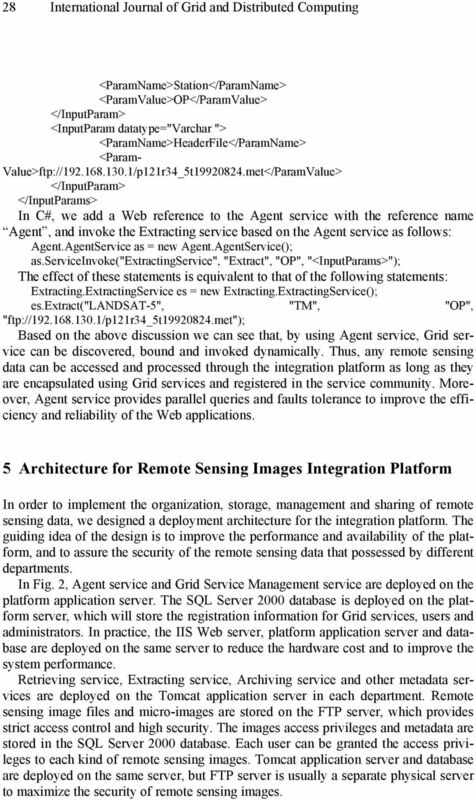 2, Agent service and Grid Service Management service are deployed on the platform application server. The SQL Server 2000 database is deployed on the platform server, which will store the registration information for Grid services, users and administrators. In practice, the IIS Web server, platform application server and database are deployed on the same server to reduce the hardware cost and to improve the system performance. Retrieving service, Extracting service, Archiving service and other metadata services are deployed on the Tomcat application server in each department. Remote sensing image files and micro-images are stored on the FTP server, which provides strict access control and high security. The images access privileges and metadata are stored in the SQL Server 2000 database. Each user can be granted the access privileges to each kind of remote sensing images. Tomcat application server and database are deployed on the same server, but FTP server is usually a separate physical server to maximize the security of remote sensing images. 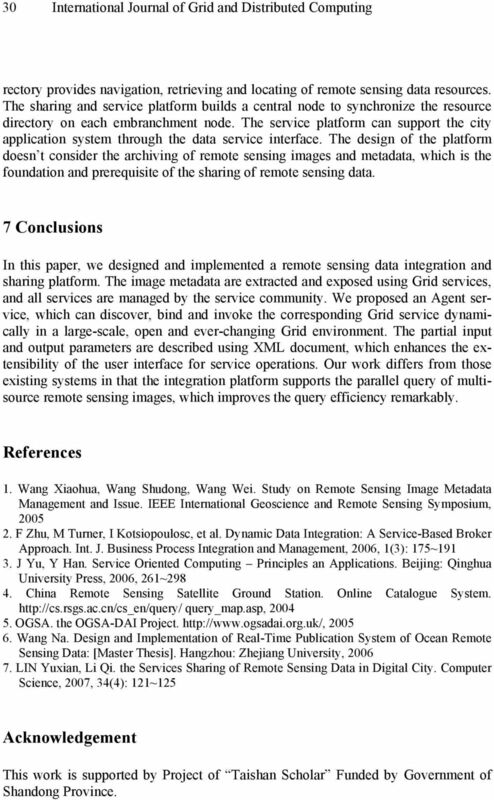 8 30 International Journal of Grid and Distributed Computing rectory provides navigation, retrieving and locating of remote sensing data resources. The sharing and service platform builds a central node to synchronize the resource directory on each embranchment node. The service platform can support the city application system through the data service interface. The design of the platform doesn t consider the archiving of remote sensing images and metadata, which is the foundation and prerequisite of the sharing of remote sensing data. 7 Conclusions In this paper, we designed and implemented a remote sensing data integration and sharing platform. The image metadata are extracted and exposed using Grid services, and all services are managed by the service community. We proposed an Agent service, which can discover, bind and invoke the corresponding Grid service dynamically in a large-scale, open and ever-changing Grid environment. The partial input and output parameters are described using XML document, which enhances the extensibility of the user interface for service operations. Our work differs from those existing systems in that the integration platform supports the parallel query of multisource remote sensing images, which improves the query efficiency remarkably. References 1. Wang Xiaohua, Wang Shudong, Wang Wei. 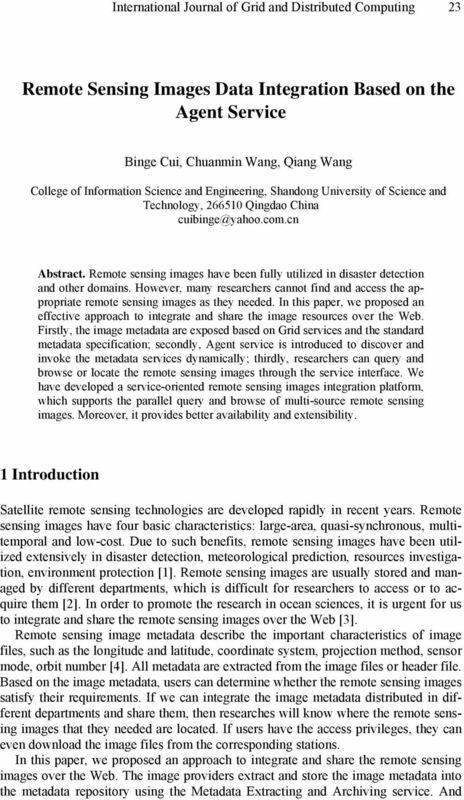 Study on Remote Sensing Image Metadata Management and Issue. IEEE International Geoscience and Remote Sensing Symposium, F Zhu, M Turner, I Kotsiopoulosc, et al. Dynamic Data Integration: A Service-Based Broker Approach. Int. J. Business Process Integration and Management, 2006, 1(3): 175~ J Yu, Y Han. Service Oriented Computing Principles an Applications. Beijing: Qinghua University Press, 2006, 261~ China Remote Sensing Satellite Ground Station. Online Catalogue System. query_map.asp, OGSA. the OGSA-DAI Project Wang Na. Design and Implementation of Real-Time Publication System of Ocean Remote Sensing Data: [Master Thesis]. Hangzhou: Zhejiang University, LIN Yuxian, Li Qi. the Services Sharing of Remote Sensing Data in Digital City. Computer Science, 2007, 34(4): 121~125 Acknowledgement This work is supported by Project of Taishan Scholar Funded by Government of Shandong Province. ER/Studio 8.0 New Features Guide Copyright 1994-2008 Embarcadero Technologies, Inc. Embarcadero Technologies, Inc. 100 California Street, 12th Floor San Francisco, CA 94111 U.S.A. All rights reserved. Journal of Marine Science and Technology, Vol. 14, No. 3, pp. 165-169 (2006) 165 WEB SERVICES OF MMS APPLICATIONS ON MOBILE DEVICES Cheng-Chih Yang* and Cheng-Min Lin** Key words: MMS, PDA, WSDL, GPRS.